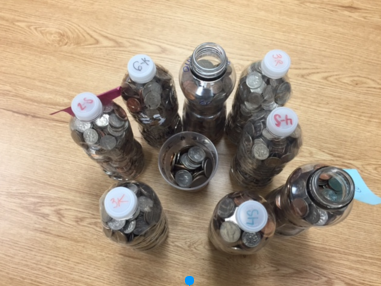 Students in the River Edge Schools are collecting dimes to help drill wells in South Sudan so people living there can have clean drinking water.The Iron Giraffe Challenge was a great success! Students at Cherry Hill School and New Bridge Center emptied their piggy banks and cleaned out their parents’ coin jars to contribute to drilling for clean water in the South Sudan. Although the grand total is still be calculated. Congratulations to Mrs. Patricinio’s 6th grade class for raising the most money at Cherry Hill School. They have earned a PTO sponsored pizza lunch. ​Our students are not only growing as productive learners but are also growing as compassionate individuals who are always striving for ways to helps those in need or less fortunate. 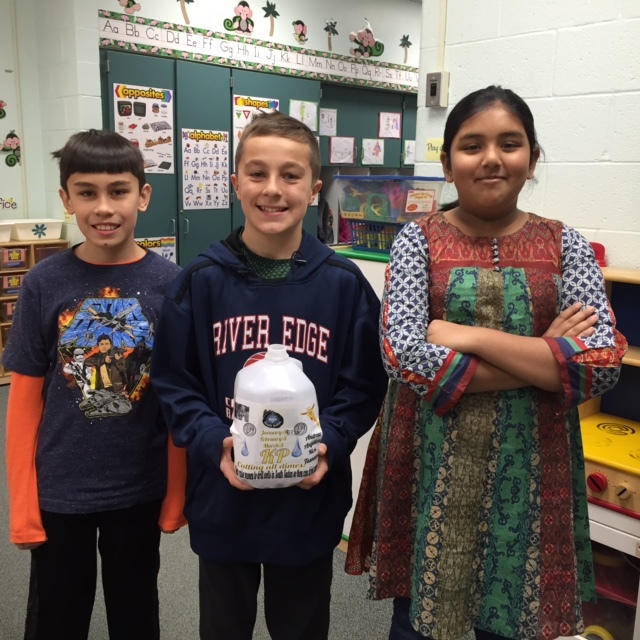 Pictured from left to right are Andrew, Nick and Tasneem from Ms. Church's 6th grade class at Roosevelt School. As demonstrated in the story A Long Walk to Water, by Linda Sue Park, even the poorest children in America and other developed nations have incredible wealth compared to South Sudanese children. 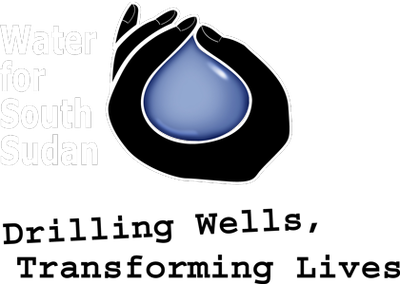 Water for South Sudan drills water wells in South Sudan, the world's newest nation. 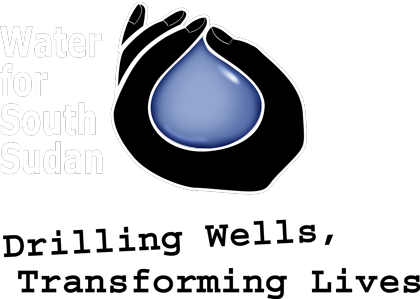 As of August, 2015, there were 259 wells, serving hundreds of thousands of South Sudanese. The drilling rig—the Iron Giraffe— is about eight years old and on its last legs. In order to continue their work, it is critical that they buy a new Iron Giraffe at a cost of about $500,000. River Edge Schools is doing their part to help! Every culture has made music and enjoys music. Whether by listening to it, playing an instrument or singing, we all enjoy music. Alley Cats, an a cappella singing group, presented an interactive, fun, and informative PTO sponsored assembly for the children at Roosevelt Elementary School. It taught students about elements of music and performance from one of America's own musical art forms: Doo-Wop. Music can create strong feelings and memories. All of the children learned about the art of a cappella singing, tempo, and pitch. The Alley Cats described the different singing roles such as bass, baritone, and tenor. What a treat to hear this fantastic group sing without any instruments! Below Left: Video captures the music and the energy! Below Right: Picture of the Alley Cats in action.